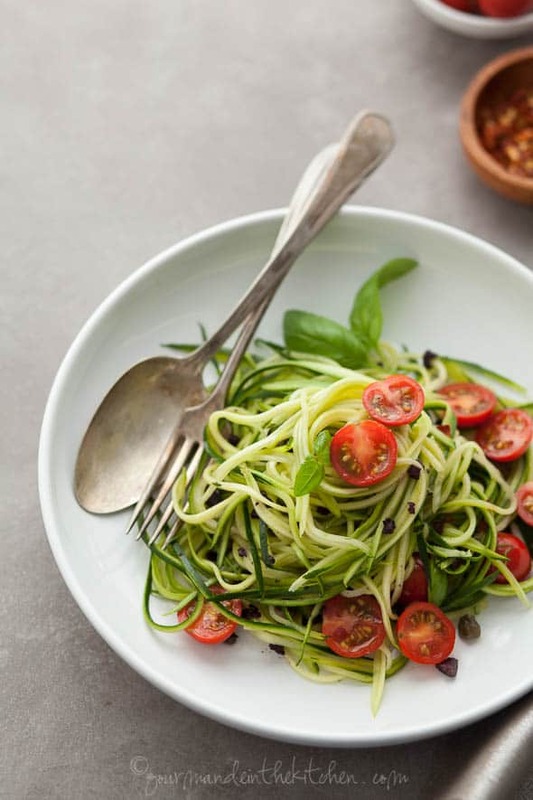 Raw zucchini noodles are topped with fresh cherry tomatoes and a tangy caper olive sauce in this fresh and quick no-cook dish. Long sunny days and warm evenings mean the stove and the oven get used a little less around often around here. Meals are lighter, fresher and piled high with vegetables, and when temperatures climb a bowl of cool slippery noodles always hits the spot. My infatuation with vegetable noodles continues with this fresh take on pasta puttanesca. Just a few minutes is all it takes to create a bowl full of zucchini noodles topped with a tangy caper olive sauce and juicy sweet cherry tomatoes. It’s an ideal meal to make in the summer months when zucchini and tomatoes are at their most plentiful. This simple dish relies on fresh basil and tomatoes for its liveliness, while olives, garlic and capers give a robust flavor to the sauce. 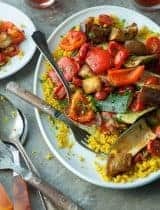 The garlic, capers and olives and a good pinch of red pepper are finely minced together to create a chunky tapenade-like base in which the tomatoes are marinated along with a good pour of fruity olive oil. The red pepper adds a subtle amount of heat, but feel free to increase it if you prefer a spicer sauce. 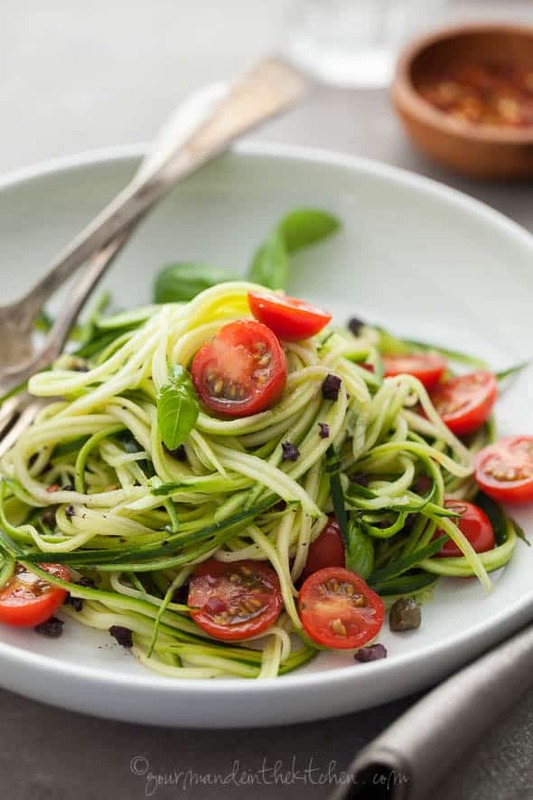 In the meantime a julienne peeler or spiralizer makes quick work of the zucchini, creating a pile of tender, silky noodles that you can twist around your fork. 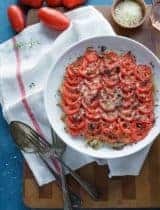 What results is a wonderfully fresh, briny, spicy vegetable “pasta” that’s filled with the flavors of the Mediterranean, not to mention that it goes beautifully with a crisp glass of rosé, so pour yourself a glass while you throw it together. Have you made zucchini noodles before? Just a few minutes are all it takes to create a bowl full of zucchini noodles topped with a tangy caper olive sauce and juicy sweet cherry tomatoes. Place the garlic, capers , salt, red pepper flakes and olives , on a cutting board and run a chef’s knife through a few times, then mash with the flat side of the knife to make a chunky paste similar to tapenade. Transfer to a large bowl and add the olive oil, tomatoes, and basil. Set aside to marinate for at least 10-15 minutes. 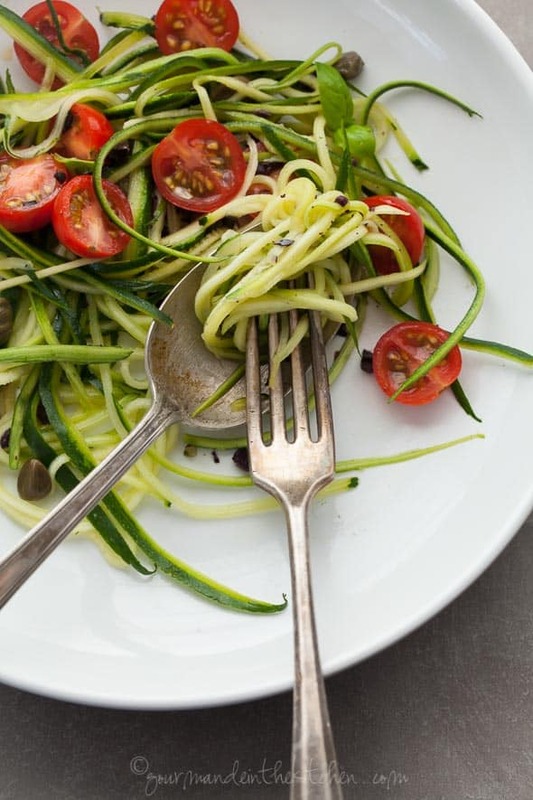 Using a spiralizer or julienne peeler , create long strips of zucchini noodles. Toss the noodles with the lemon juice and add to the tomato mixture. Toss gently and serve with additional capers, olives and basil on top if desired. Can't wait to try this - it looks delicious! Love the combo of flavors. YUM! This recipe sounds intriguing - I'm not a great fan of olives or capers, but I could see doing this. I've made zucchini noodles twice now, and love them. 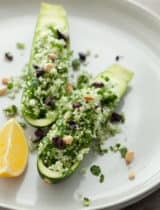 It's easy and that is the only way I've found that I really like zucchini (If I sound like a picky eater, I'm not; there are just a few things that I've never liked much). I think that buying a spiralizer is one of the smartest things I've done for my kitchen. I also love it that when you give people zucchini noodles, they don't realize that they aren't eating pasta. 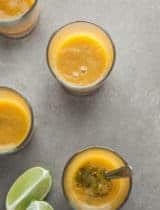 This recipe sounds so simple and elegant - I love it! Love the briny flavors in your zucchini noodles! Looks so pretty Sylvie! I still have not tried zucchini noodles but I need to! 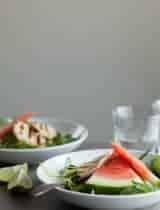 This looks so healthy and perfect for a light summer meal. This looks so satisfying for a hot Summer night. Also, your food photos! Gah! Always so beautiful. Olive-caper sauce? Wow. That sounds AMAZING. I love both both. And this looks gorgeous. So fresh and pretty, perfect for hot summer days! 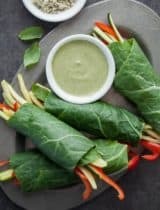 What a gorgeous recipe and photos. It looks like a perfect summer meal! 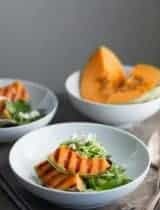 This salad is absolutely divine!!! 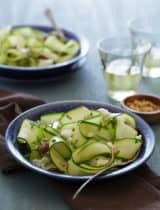 Love raw zucchini, but I've never had it as a main salad ingredient. Thanks for the inspiration!!! So light and fresh. The perfect summer dish. What a lovely recipe! We've been making more veggie noodles lately - here's hoping our zucchini grows :). My family loved it! I served it tonight alongside a tray of deli meats and cheese for a cool, no-cook summer supper. Thanks for the recipe. I'm so glad to hear everyone enjoyed it!